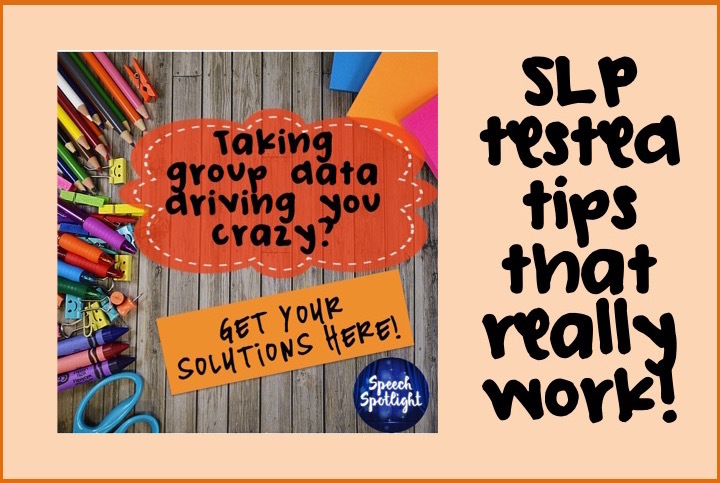 Taking data for a mixed group can equal a nightmare for SLPS! 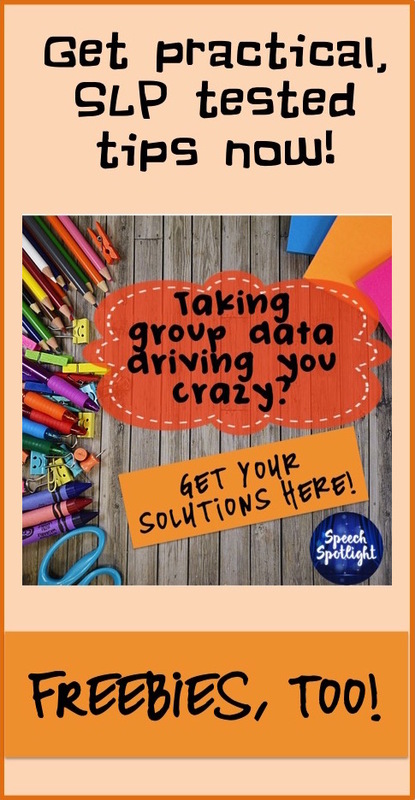 Reader feedback recently told us that taking data in large, mixed groups can be quite difficult! Yes, it is, but we have some ideas for you try out. We have a lot of experience here to help you out! The list has a variety of techniques you can try to see which work best for your situation. Be sure to keep reading, since there are links to more in-depth blog posts about data for a mixed group. Some freebies, too! *Make a data sheet for the group that has all of the targets you will be taking data on. Less pieces of paper make it easier to manage the activity. You can get a freebie for this here. 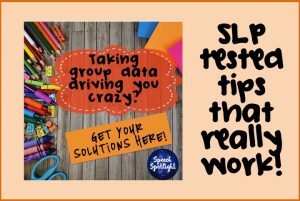 This post also has links to FREE data sheets from SLPs on TpT! *Fill in the target sheet with the specific targets you plan to take data on and make sure you cover those during the session. Place a mark on the data sheet next to the student’s name only for the errors. *Think about which parts of your plan are best for the goals you need to cover. Then take data for the students in the group who are working on those goals only during that part of the session. 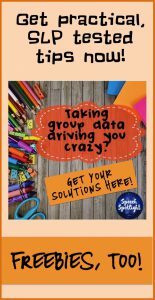 *Accept that you will not always be able to take specific data on every child during every activity in a group. Rotate the kids who you will do this for every session. For the others, provide a rubric score of general accuracy level. Be sure to note at least one specific time that each student in your mixed group generalized a skill or had an authentic problem using what you have been targeting. You may be surprised by what you find out about your students’ speech and language skills when you allow yourself to step back and just look at the big picture! *Structure your sessions to start off with an easy drill activity that lets you catch accurate trial data for the whole group quickly. Then move on to your longer, planned activity. Find more ideas for this here. *At regular intervals, like before report cards, you can “test” their skills. I use specific pre/post measures to see if students in the group have achieved their goals. The benefit for me is that activities that are not interactive make it easier to be sure that I am not unintentionally prompting answers! Give your language goal students in the group work on something written, or cut and glue with pictures. Then, you can spend a minute or two with each articulation goal student to take some quick data. *Using a mix of data keeping techniques can reduce your stress levels. More importantly, it provides you with a more varied and authentic picture of how your students in a group are actually using their target skills to communicate! My friends on the blog chipped in, too! More ideas are better! Tami takes data by 5’s! She organizes her data sheets with the highlighted goals for each child. Then she tags the parts of her stories she will use for data. In the classroom, she enlists the help of the aides. Ashley B. has a great post for you with pictures of how she organizes her data! I hope this helps you find taking data in mixed groups a bit less daunting! Do you have other tips to share?